There are many different types of people who must deal with the problem of incontinence. This is in direct contradiction to the belief that the only people who have to manage incontinence are those who are old, ill, and bedridden. Incontinence is a problem that can affect people of all ages, varying health status, and both genders. If you or someone you care about is experiencing incontinence symptoms the first decision that needs to be made is to choose incontinence supplies that can be effective for managing their incontinence. Abena adult diapers are made with wood fibers from sustainable forests-There is a great deal of wood that is used in the making of any adult diaper. The manufacturers of the Abena adult diaper line only use wood that has come from sustainable forests. This means that any trees that are used in the production of the Abena adult diaper will be immediately replanted. Abena adult diapers are made with raw materials that have the highest standards-The manufacturers of Abena adult diapers insist on using raw materials that meet the highest standards of production. Everything that is used in an Abena adult diaper must comply with the strictest standards concerning the purity and origin of the raw material. Abena adult diapers are made without chemicals-Many types of incontinence supplies come loaded with chemicals, perfumes, and lotions that are not only not ecologically friendly but can be damaging to the skin of the wearer. Abena adult diapers are made free from any chemicals or perfumes which can be irritating to the delicate skin of the person wearing the incontinence undergarment. Abena adult diapers are made in such a manner that the waste must be cleaned-The manufacturers of the Abena adult diaper are not only concerned about the finished adult diaper but also with the waste that their plant produces. They insist that all waste water must be cleaned and recycled and contain far less then the accepted level of waste chemicals. This means that they are reducing the footprint of their manufacturing. Abena adult diapers are made with a minimum of waste-The makers of the Abena diaper insist that their manufacturing process only have 5% waste. This is one of the lowest amounts of waste in any type of manufacturing process and is especially low in the manufacturing of incontinence supplies. 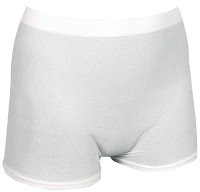 Wearers of the Abena adult diapers can be assured that they are leaving a very small carbon footprint if they choose to use this type of adult diaper. Abena adult diapers are made with recyclable packaging-The manufacturers of Abena adult diapers have also extended their green reach to the packaging that they use. All packaging for Abena adult diapers is recyclable and they insist that all information is very readable on the packaging. This makes using this type of incontinence supplies even easier for the user/wearer. The bottom line is that Abena adult diapers are made according to the highest government standards which makes them an environmentally friendly and green incontinence product to use when managing incontinence.